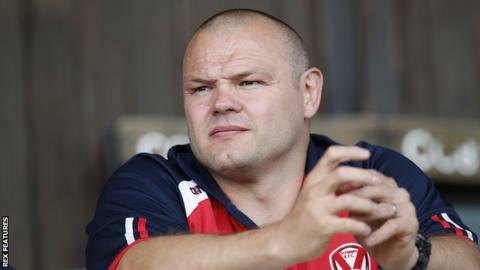 St Helens coach Keiron Cunningham says he is happy with his side, despite being criticised by a minority of fans for aspects of recent displays. Saints have won four of their five games to lie fourth in Super League. "We've scored over 100 points in our last three games. To tell me that we aren't attacking well, I challenge them to prove we aren't," he said. "I don't understand how it started. It's like people are jumping on backs of things that don't need jumping on." Cunningham added: "I am more than happy with where we are at. If the fans aren't happy with that then I can't change that. The most I can do is pick up results and get my team playing well." St Helens thrashed Wakefield 44-4 on 11 March, but have conceded 104 points in their previous four Super League matches this season, as well as 38 points in their World Club Series match against Sydney Roosters. "I understand defensively we've not been as good as we can be, but we kept a side to four points at the weekend and we threw [Wakefield] an intercept pass which should have been a try," Cunningham told BBC Radio Merseyside. "For me it's almost you get into this mindset and moan about something that doesn't even need it. "I think we are playing well. Can we play better? Everyone can play better but for where we are in the competition, we've still got a long way to go, as has everybody."